Life's A Tomato - Ripen up your life!Life's A Tomato | Ripen up your life! This is not the first book on making ice cream and other frozen treats that I’ve had in my library. But oh is David Lebovitz’s The Perfect Scoop ever the best and by far full of the easiest recipes. I found the recipes to not only be fantastic tasting, but all can made with pretty minimal effort and ingredients. That’s a big win in my book. The Perfect Scoop starts out with the basics of making ice cream. You might be tempted to skip this section and skip to getting to making the good stuff, but you should read it at least once. It’s full of tips and techniques and information about ingredients that will help you make the absolutely best treats. Next, we’re on to my favorite section, ice creams, frozen yogurts and gelatos. There’s an absolute ton of recipes in this section. Everything from ‘normal’ vanilla ice cream to basil ice cream. All well-written and none are scary enough to make the novice ice cream maker nervous. Not even 30 minutes after I got The Perfect Scoop I was making the chocolate-peanut butter ice cream. With only 5 ingredients it has quickly become a staple in our freezer. Sorbets and sherbets are next. And there’s tons of recipes in this section, too. Really easy to make, and packed with fresh fruits. Proof you don’t have to use heavy cream to make a delicious frozen treat. Granitas are in the next section of The Perfect Scoop. Making granitas is something very new to me, though I’ve seen it done on TV before. Darn near every recipe in this part of the book is on my to-do list. Again, all great stuff. The last two chapters of the book are just fun. Sauces and Toppings contains everything you could ever need to turn your yummy ice cream from the second chapter of the book into something unbelievably good. Make your own marshmallow sauce. Or raspberry sauce. Or hot fudge. It’s all in there. And the Mix-Ins section? Even more great ways to customize your ice cream creations. Things like peanut brittle , fudge ripple, and truffles. Your friends and family will be amazed by the fact that everything in their bowl was made by you. David Lebovitz’s The Perfect Scoop is a great book for anyone interested in making their own fabulous desserts. 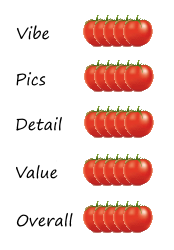 It rates very high on my ‘Mater Rater scale. For more of my reviews of cookbooks available for the Amazon Kindle readers, visit Kindle Thyme.